UKIP’s new friends in Europe – members of the Polish KNP party – think disability is an “epidemic” and disabled people shouldn’t be seen on television because we should see only “healthy, beautiful, strong and wise people on our screens“. The leader of the KNP – Janusz Korwin-Mikke – wrote the disturbing views on his blog. But because his words were in Polish, it got little attention in the UK, even when Nigel Farage decided to ally himself in the EU with the far-right party. Mikke also likes to give Nazi salutes in public. Nigel’s allies in Europe have some pretty disgusting views on other things too. Well done Nigel. You’ve just confirmed once and for all every accusation there has ever been of racism, sexism and homophobia against UKIP. But of course, Farage will get into bed with anyone if £1 million of European Parliament gravy train money is at stake. People will still vote Ukrap because they think the same way. Anyone thinking that UKIP’s allies aren’t screaming racists, bigots, homophones and just generally dangerous should take note of this. Tom Pride here reveals the complete lack of any kind of morality behind UKIP’s alliance with Korwin-Mikke’s party in the European Parliament. These are Nazi views within the meaning of the act, your honour. Their the pseudoscientific views on the evolutionary inferiority of women and racial senescence that permeated the European right, and much of the left, in the 19th century, and which led ultimately to the rise of the Nazis. The attitude to women is fairly standard chauvinism, given a pseudo-scientific justification through citing evolution as a cause. The late evolutionary biologist and palaeontologist, Stephen Jay Gould, despatched this way of thinking in his book ‘The Mismeasure of Man’, which described and refuted the way Fascist and proto-Nazi ideologues had misused evolutionary theory to justify their own oppression and marginalisation of women and the lower classes, and the exclusion and murder of ethnic minorities. Korwin-Mikke’s rant about the disabled is similarly based on eugenic notions that modern society, by allowing the disabled and racially unfit to live and breed, will result in humanity becoming increasingly weak, disease and senescent. AS for stating that ‘gays are a gang of louts imported from abroad’, this seems to be the standard rhetoric from homophobic countries. You can hear it from Mugabe’s Uganda, where he was banging on about Blair’s government being run by the ‘gay mafia’. “another member complained about the impact of immigration on the NHS, writing: “I am informed by past media that Black Caribbean and not Black African have a higher instance of schizophrenia. “latest comes by way of John Rees-Evans, who is planning to stand for the party in Cardiff South and Penarth in May. He joined the ranks of the homophobes that thrive in UKIP when he said his pet horse was raped by a ‘homosexual donkey’. There could be nothing wrong with such a statement on the surface but dig a little deeper and it is easy to see who the real donkey is. I guess my eyes are tired today. It looks to me like there is not one word about Jews (me) in there. his methods are generically similar to my 1984> therapy, but with far greater, refinement and accuracy @ getting to the roots of all unnatural anxiety (emotional injuries)….all unnatural anx is caused by abuse, a frozen terror occurs when rage of the offence is frozen in/@ the time of abuse, frozen terrors mount up to become a thick wall of numbed silence, people often act out role models coz their true personality is mushed, in the abuse blender ….anxiety is a symptom not the cause…. unresolved abuse caused by deprivation ie austerity, is making people sicker…. neoliberal solution blame the victims…. Don’t like the disabled, hate foreigners, hate gays, women’s place is in the home. I’m sure there was another party leader saying this stuff. He didn’t like East Europeans either..? Ironic he loses his position when its discovered he’s Fathered children outside of marriage! No surprises. I agree that UKIP are “BNP lite”. When will former Labour voters realise that Farage is no more than a posh neo-Thatcherite ‘spiv’? I would comment but I’m lost for words. We seem to be going into some very dark places – and Farage has aligned himself with this lot! Well no, ten years ago I could actually hear English people talking on the way to work. Now I just hear an East European/African/Asian babble. If you are merely talking about the buildings, then yes, they are mostly the same, but everything else has changed. Bloody hell! Foreigners at Heathrow airports? Whatever next? Great read, and again reiterates the flaws with UKIP and co. as well as their political absurdity/backwardness. This quote stood out though, particularly seeing how UKIP and other Right Wingers such as the Polish KNP try to create a credible and reputable image. These politicians associate with morons, racists, xenophobes, and we have an abundant collection of relevant examples in the UK alone – Rozanne Duncan being the most recent. The association with these fanatical individuals will continue to present parties such as UKIP as archaic. 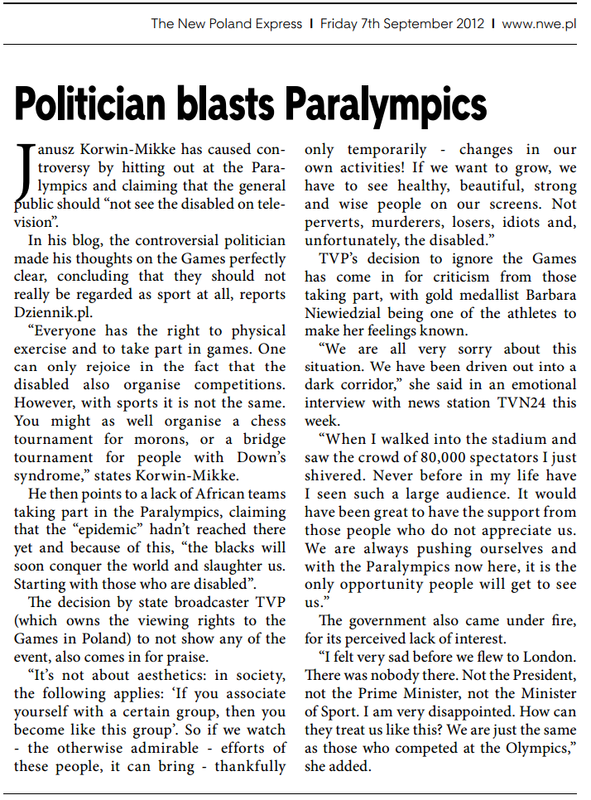 The irony stands in relation to this article and the politician in question that he believes society will suffer by viewing the paralympic games, which apparently will reduce humanities overall healthiness… I believe society will suffer at the expense of their irrational rhetoric, which unfortunately convinces the ignorant among us that their way is the right way. Do you ever bother to look what the “allies” in europe of the other parties are saying? after all it is only because of eussr regulations that parties have to be allied with foreign parties in the parliament otherwise they can’t speak at all. So much for democracy of our unelected government in brussels the commissions legislation eh. is that true…have you never said vitriolic things about the people you share your building with? ok another question…which support orgs do you advocate for victims of CSA/CA? ie NAPAC and/or any others? i’m also interested in how your claim that a CSA inquiry helps victims to recover, and how compensation alleviates suffering, unless of course it’s spent getting effective therapy?